Car successfully made it to Winnipeg and back with no major issues. It was able to make it one way on one tank (~61L), just under 700km, and averaged 8.5L/100km there and 8.0L/100km back (27.5mpg and 29.5mpg). 2279km for the whole trip. Long post time. I Recently installed the set of headers I purchased last summer, it only took me 10 months. The whole install took me about 8 hours or so, which seems to be the average among first time installers. I tried to take as many pictures as possible along the way but I just wanted to get it done so I may have missed a few here and there. I began by removing a few parts to gain access to the headers from both the top and bottom. 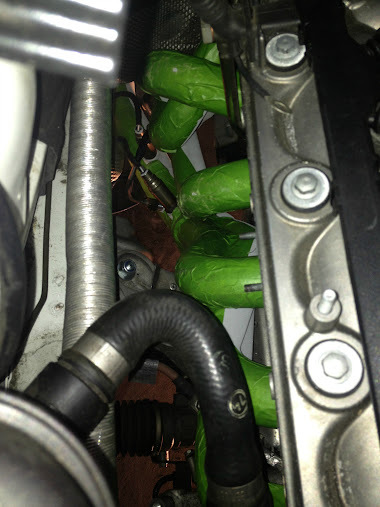 First removed the cabin air filter gain access to the cylinder 5 & 6 areas. Then I removed the plastic engine cover to gain access to the O2 sensor and EGT sensor connectors. Next came the secondary air valve and pump as well as the two heat shields, one on the frame and the other on the engine. The air pump can be seen in the bottom right corner connected to the valve in the middle with the black hose. The pump and valve are there to help with the cat heating sequence during cold startups. They were removed since I'm no longer running cats. 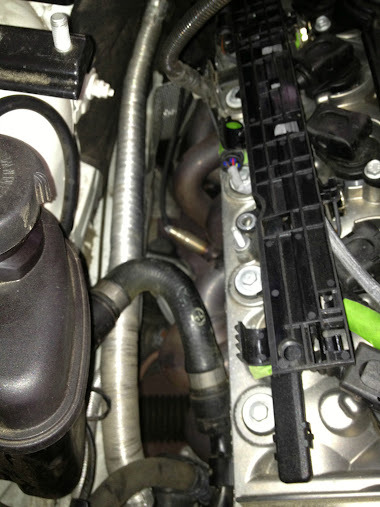 I chose not to remove the coolant hose and make a mess which make it slightly more difficult to remove the heat shields. Next I got the car up on jack stands and removed the lower metal reinforcement plate, which helps protect the oil pan and stiffen the chassis. 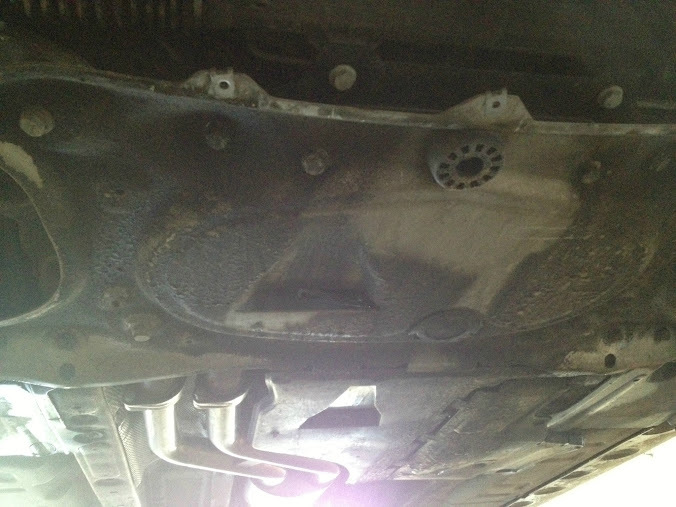 Also had to remove section 1 (down pipe) of the exhaust and a couple under trays. I labelled all the O2 sensor connectors so that I wouldn't mix up the banks and positions when reinstalling them, a common issue a lot of people have. Then the fun began. It took me 2+ hours to remove the 18 nuts holding the headers in place using multiple extensions, joints, short and deep sockets, wrenches and a lot of patience. Having two 400 cell cats in a small area made it more fun. In order to remove the headers I had to slide both out at the same time due to the cats and the configuration. I got lucky and only removed 4 studs from the block and had ordered 6 new ones. If you install cheap ebay headers with thick flanges you have to remove all the studs and replace them with E36 headers studs. While I had the headers out I chose to work on a few other jobs. One was the CPV (constant pressure valve) on the side of the block, just in front of the transmission. It's a very common problem and they're known to leak quite early due to the o-rings so I ordered a new Viton o-ring from M3forum member for $5, cheaper than a new $40 valve that will just leak again. You can see the oil seepage along the block and transmission. Cleaned it up with some degreaser after the valve was reinstalled. The old o-ring was flat and hard. Driver/Passenger old mounts. Notice that the old passenger's mount is slightly shorter than the driver's side mount, due to the rotational force of the engine. After all that was done after an hour or two, I went back to work on the headers. I transfered the O2 sensors one by one as not to mix them up. The connectors had special keys that match the ones on the harness depending on which bank and which position they're in. Everything went smooth up until the very last O2 sensor on bank 2, which as you know I stripped. After that I took the one header to a machine shop to get the bung tapped out, luckily it had done most of the stripping and wasn't stripped as bad as the O2 sensor which had to be replaced. That night I tapped up the headers as not to damage the coating when installed the headers. It actually worked quite well. 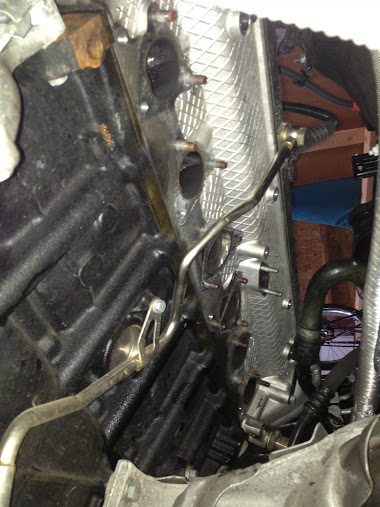 The headers took a bit of convincing to get into place and then onto the studs without making the gaskets fall off. I had to slightly push out one of the primaries to get the flange to slide over the studs but it ended up sitting flush against the block. Everything installed, bolted in place and put back together. Left the heat shields off. Couple videos of starting the car up with just the OEM headers and the new headers. Overall I am very pleased with the performance of the headers. I took quite a few under hood temp readings before I did the install and found that under the same driving conditions, a few minutes after shut down, the temperature difference was around 15-20 Celcius lower than before. When I used to open the hood after driving a while you could feel a wall of heat hit you, now you can open it and you barely feel anything, even without the heat shields. The car also pulls much harder once it hits 3000 rpm and keeps pulling all the way to 8200 and it is quite noticeable. I still have to weigh a few pieces but I think I probably shaved off 10 lbs or so with this install. There is a slight downside to the headers but it can be fixed. Due to the more free flowing nature of the new headers the car is considerably louder in the cabin when cruising at highway speeds and can tend to get quite tiring on long drives, lets say to Winnipeg and back. Because of the additional resonator in section 1 there is a drone between 2500-3000 rpm which happens to be what the car falls into in 5th and 6th gear at highway speeds. There is also a lot of rasp that can be heard in the cabin, especially at 3000 rpm and up but only when you really open the throttle. It's not as bad from outside but the rasp of the S54 has always been a pet peeve of mine and before the headers there was none due to the resonator in section 1 (rasp terminator). Anyone who has been to the autoslaloms with the other M3 with the stock exhaust knows what I'm talking about. I've heard this can be remedied slightly with two 200 cell cats just before the resonator, although you lose a few hp. The car also handled amazingly on the highway, in Winnipeg and at Gimli. I had a nut come loose on the right rear strut due to Winnipeg roads but it was an easy fix. Don't complain about Thunder Bay roads until you've driven a lowered car in Winnipeg. The roads there were so bad that the bumps and dips would extend across 3 lanes and were unavoidable. If you were in the wrong lane the whole road was a washboard. My car isn't that low and I still would scrap driving slowly in a straight line. I'm still working on editing and uploading the videos from Gimli but I will have a review of my time there when I finally get all the videos up. Last edited by Nabs; 07-02-2013 at 06:46 PM. The ceramic coating on the headers looks good. Good updates. Yay for headers with ceramic coating! looks great! The bumps made it even more scary but fun. Hitting them at 160 while going from side to side on the track or around a corner would make it feel like the back end was about to go out so it made you alert. The videos make the track seem a bit more bumpy than it actually is. My suspension being at almost full stiff didn't help much either. My internet is super slow so it takes almost a day to upload one video; I'm going to try and upload the rest at the university soon. I would love to see your 540 when I get back from work. I've seen some pictures and noticed quite a few M5 pieces on it. I love the E39 body style and was lucky enough to go on the track with one. I would actually prefer it were brighter, plus it goes with the interior of the car. The new wheels will be dipped white when/if I ever get a chance to transfer the tires. I will eventually paint the OEM wheels a brighter red and use them for track wheels once I get some better track tires. Thanks! Those headers were a major PITA to take out but it was definitely worth it. I'm slowly getting adjusted to the additional exhaust noise and the rasp but it seems as though most people like it, some even have said it sounds like a race car. I finally ordered a proper Bosch O2 sensor to replace the one I bought in town as a temporary fix, it was actually cheaper for the proper sensor than the one I bought in town! No more check engine light!